South Sudanese tycoon Lawrence Lual Malong Yor Jnr (file photo). The youthful South Sudanese 'tycoon' who recently flossed about his wealth on social media and during an interview on Citizen Tv has been remanded at a Kampala Prison after he was charged with fraud. Lawrence Malong Lual Yor was on Thursday remanded at Luzira Prison alongside two other people. The 30-year old from South Sudan and a resident of High Neem No.3 in Juba and Mirano Hotel in Kabalagala, a Kampala suburb, was jointly charged with a broker of Congolese nationality, namely Mike Okitalunyi Lota, and Gavanna Thaddeus Zikusooka alias James Byaruhanga. According to the Daily Monitor, the trio was charged in a Magistrate's Court at Buganda Road presided over by Joan Ketty Acaa with obtaining money by false pretense, a charge which they denied. Ms Acaa remanded the suspects until April 4, 2019, to await a mention of their case after their lawyer Fred Erisata asked the court for a shorter adjournment to enable the suspects to apply for bail. Malong and the other suspects are accused of obtaining $1.9 million dollars (about Sh200 million) from businessman Wegnew Desire purporting to sell to him 150kg of gold. Malong - a businessman and socialite known for posting photographs of himself 'swimming' in dollars was arrested by the International Security Organisation (ISO) operatives in November 2018 in regard to investigations that linked him to gold scams in which several foreigners had lost billions of shillings. In an interview, Wegnew, a South African businessman of Ethiopian origin, explained that the suspects approached him purporting to sell him gold at $23,000 (about Sh2.4 million) per kilogramme. "When I paid them money for the kilogramme, they told me that the shipment was not possible for small amounts. They asked me for more money so that they can ship five kilogrammes. I flew to Dubai but while there they called me to Uganda and they told me to give them more money such that they could sell me 150kgs," he said. All this while, Wegnew claims Malong offered himself as a holder of a license to trade in gold while Lota was the alleged seller. 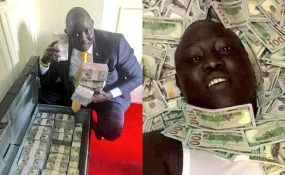 Malong initially hit the headlines after he uploaded several photos and videos of himself 'swimming' in United States Dollars on Facebook before later appearing on the Jeff Koinange Live talk show where he flossed about his wealth. Jeff Koinange: "But that was you swimming in the money, right? Malong Jr: Yes that's me. Jeff Koinange: You did that deliberately right? Malong Jr: I always do that because as you know I am very rich man, as you can see (pointing at his shoes) I'm wearing Jimmi Choos, how much do they cost? You know yourself $10,000 (about Sh1 million). You know the same Rolex you are wearing it, it is $100,000 (Sh10 million). Jeff Koinange: So you are a wealthy man in your own way. Malong Jr: Yes, and I mentioned in my video that I got my wealth from my Lord Jesus Christ.